WASHINGTON, D.C. -- Led by Bolivia and El Salvador, Latin American countries dominate the top of the list of the most emotional countries in the world for 2014. On average, nearly six in 10 residents in each of these countries reported experiencing positive or negative emotions the previous day. Post-Soviet states largely dominate the list of countries at the other end of the spectrum, where at most four in 10 residents reported experiencing any of these feelings. Separately, the questions about positive and negative emotions make up Gallup's Positive Experience and Negative Experience Indexes, respectively. Both indexes attempt to quantify how people live their lives -- as opposed to how people see their lives. Perhaps surprisingly, the Positive and Negative Experience Indexes are not inversely related. Meaning in some countries, many people might report laughing and smiling a lot and also report a lot of sadness or anger. The lack of a relationship between the two was the impetus for this analysis -- to quantitatively show how residents of some countries report experiencing a lot of emotions overall, while residents in others tend to express few emotions -- positive or negative. Culture appears to play a major role in these results. The single variable that predicts results on both indexes is country of origin, suggesting that there are cultural biases in how people answer these questions. In fact, after the release of the previous results that showed the Philippines to be the most emotional country in the world, a diplomat from the Philippines explained to Gallup that culturally, people in the Philippines are emotional. "The focus we [Filipinos] place on interpersonal relationships impels us not only to experience emotions more intensely," he said, "but also to be more open in their expression." Gallup's experiential indexes are also sensitive to major events. The civil war led to a collapse of positive emotions in Syria in 2013, the most dramatic decline Gallup has seen to date. Furthermore, conflict-plagued Sudan was the lowest in the entire world for positive emotions last year. Greece's economic collapse also created a dramatic increase in negative emotions within the country. 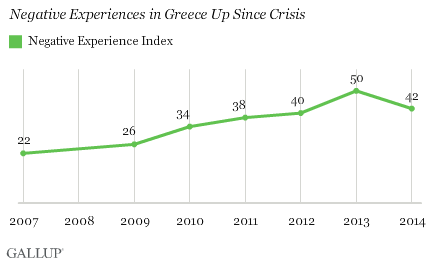 Since 2007, the Negative Experience Index score in Greece has doubled, and the country ranks among the top 10 in the world for negative emotions. The Negative Experience Index is also influenced by additional factors such as physical well-being and people's personal economic situations -- all things that plague countries such as Iraq, which had the highest score in 2014. The Positive Experience Index is influenced by things such as personal freedom and strong social networks, which might explain why people from countries in Latin America that aren't wealthy still seem to live positive lives. These measures attempt to quantify how people experience their lives through human experiences such as laughing and smiling a lot or feeling anger or stress. The drivers of the Positive and Negative Experience Indexes are not typical economic indicators such as income or GDP, but rather non-economic aspects such as freedom, family and social networks, culture, instability and war. 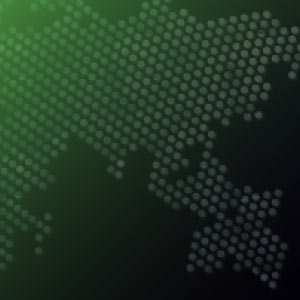 Gallup's Positive and Negative Experience Indexes provide a more complete understanding of how people worldwide are experiencing their lives by quantifying the non-monetary transactions of life. Leaders who are interested in moving beyond economic indicators as proxies for human development would be wise to look into metrics on how people are experiencing their lives. Read the 2015 Global Emotions report. Results are based on telephone and face-to-face interviews with approximately 1,000 adults, aged 15 and older, conducted in 148 countries throughout 2014. For results based on the total sample of national adults, the margin of sampling error ranged from ±2.1 percentage points to ±5.6 percentage points at the 95% confidence level. All reported margins of sampling error include computed design effects for weighting.